Rod Duncan worked in scientific research and computing before settling in Leicester to be a writer. His first novel, Backlash, was short-listed for the John Creasey Memorial Award (now the CWA Debut Dagger). After four crime novels he switched to fantasy, and is currently writing a series of alternate history books, called ‘The Fall of the Gas-Lit Empire’. Rod is also a screenwriter, and was once eaten alive in the feature film Zombie Undead. Hi Rod, welcome over to The Book Plank and for taking your time to answer these few questions for us. BP: First off, could you give us a short introduction as to who Rod Duncan is? What are your likes/dislikes and hobbies? RD: I am insatiably curious and a compulsive communicator. Or, to put it another way, I am a writer. I love the company of creative people. Walking in the countryside is a great pleasure and helps me to process what I am writing. As for dislikes – yes, there are plenty of these. But I’m going to hold those cards close to my chest. I’m trying to train myself to reflect on the positive side of life. BP: You have been writing for many years already, do you still know the moment when you decided that you wanted to become a full time author? RD: I am dyslexic. That barred me from any possibility of writing down the stories that tumbled around in my head. Then came the word processor. I started writing in the early 1990s and haven’t stopped since. BP: Do you think your earlier professions in scientific research lended a hand in writing? RD: My father was a physicist. Even when I was a very young child, he would explain things to me in terms of scientific method. That has had a profound influence on the way I see the world. It certainly informs my writing. BP: You started with writing crime fiction and recently made the switch to fantasy, why did you decided to do this, was it a completely new way of writing? RD: The short answer is that the story which grabbed me and demanded to be told was the Bullet Catcher’s Daughter. I was brought up on SFF, so perhaps it is not so surprising. As to the question of whether it was a new way of writing – at first I thought it would not be. But whilst writing it I started to understand things about the genre that I had only seen from the outside before. And, yes, I had a lot to learn. For me, that was a bonus. 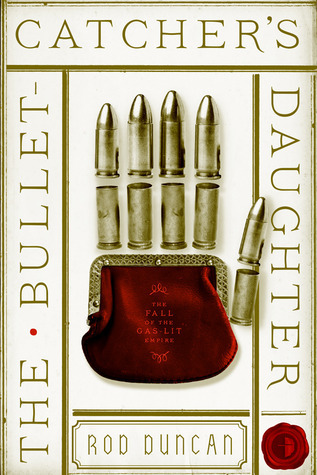 BP: The Bullet-Catchers Daughter is your first fantasy book, what gave you the idea behind the story? RD: I live in Leicester, a city in the English midlands. Much of it was built in Victorian times. Walking through its streets you catch glimpses of that earlier world. Perhaps the road has been worn away in one place and cobblestones show through from underneath. Or you look up and see an inscription under the eaves of a terraced house, left there by the Victorian builders. To me it feels like a parallel reality is just under the surface. I started to ask myself this question: if I had the power to reach back in history and change small details, is there anything I could do that would result in the Victorianesque world still being here in the 21st Century? It had to be believable. And it had to be the smallest possible intervention. The story flowed from that. BP: The Bullet-Catchers is out August 28th later this year, if you would have to sell your book with a single sentence, how would it go? RD: A riotous novel of alternate history set in a divided England. BP: Having written crimes book earlier in you career, do you think it has given you experience that you were able to use when you were writing The Bullet-Catchers Daughter? RD: The Book is essentially a crime novel set in an alternate history. The crime writing rules hold good. So, yes, that experience was a great help. BP: The Bullet-Catcher Daughter is alternate history, did you have to carry out any additional research to keep certain fact straight? RD: I have ‘intervened’ in history by reaching back a couple of hundred years and making one small change. It was important to me that everything had to flow logically from that point. Thus I had to do lots of research into things that really happened in the early part of the 19th Century. It also meant researching the real world impact of certain technologies that have not been invented in the world of the book. BP: Did you encounter specific problems when you were writing The Bullet-Catchers Daughter? RD: The story did not take too long to write. But it took an age to edit. Most of that extra time was me trying to figure out how to tackle the world building. I knew what the world was like – but how could I reveal that to the readers from the point of view of someone on the inside? Ultimately, I was really happy with how it turned out. People have been kind enough to praise the book for its world building. That meant a lot to me. BP: What was the hardest part when you were writing The Bullet-Catchers Daughter? RD: Certainly the world building. BP: Besides the hardest part of the book, which chapter/scene did you enjoy writing about the most? RD: There is a card game described in one chapter – a variant on poker called Wild Eights. I found it technically challenging to write. The scene serves as introduction to a new set of characters. They are all chatting together, playing the game - the rules of which the readers won’t know because I made it up. On top of that, there is power struggle going on between two of the characters. And the outcome of the card game is crucial to the plot. I had to write it several times before I was satisfied. But now I am particularly fond of it. BP: If you would be given the chance to rewrite any particular scene of The Bullet-Catchers Daughter before it hits the shelves in August, would you do so? If yes, which part and why? RD: Ask me that question once I have written more books in the series. By then I might have found some detail of the world that it would be convenient to have cast differently. But as of now, I would not want to change anything. BP: Will The Bullet-Catchers Daughter is the first book in a series, have you already mapped out how many books will follow? RD: I do have the series mapped out. But saying how many books I have planned and named would be a hostage to fortune. I’m going to keep that secret for the moment. But you can get a sense of where we are heading and the magnitude of the journey from the series title: the Fall of the Gas-Lit Empire. BP: Do you have any other projects that you would like to pursue now that The Bullet-Catchers Daughter will be published? RD: The Fall of the Gas-Lit Empire will be my main focus for some time. But I have never been able to resist creative projects when they suggest themselves, so I will surely be writing other things as well. Screenwriting is important to me. I do that collaboratively so it gives me an experience quite different to prose writing. BP: Everyone enjoys science fiction and fantasy in their own way, what do you like most about it? RD: Great SFF explores concepts in the same way that great literary fiction explores form and language. That’s what I love about it. It is a playground for thought and imagination. BP: If you would have to give you top 5 favourite books, which would they be? But ask me on another day and I will probably give you a different answer. BP: And just lastly, can you give us a sneak peak as to what will be in store for the readers of The Bullet-Catchers Daughter? BP: Thank you very much for your time Rod and good luck with your future writing projects! RD: Thanks. I’ve really enjoyed it. Media Alert: Gollancz Festival is imminent!